When the authors of this book took part in Project INFUSE, the National Science Foundation–funded teacher development program, they noticed something. Life science teachers were highly receptive to engineering ideas related to everything from genomic testing to biofuels. But they also saw that teachers struggled to develop age-appropriate, standards-based lessons. The teachers asked for help facilitating the kind of open-ended design challenges that are useful to presenting engineering concepts in quick, engaging ways. •	Content-rich. Six fully developed lessons show how to use engineering concepts to enhance life science courses. The lessons draw on each of the major content areas in biological sciences, including structures and processes, ecosystems, heredity, and biological evolution. Standards-based. This book will help you see how to weave the engineering thread from the Next Generation Science Standards into and throughout your content. •	Engaging. Lesson titles include “Designer DNA,” “Ecosystem Board Game,” and “B-pocalypse,” which is about battling the decline in bees needed to pollinate crops. •	Practical. Inspired by extensive field testing, the authors made the lessons easy to use in diverse settings. The book is packed with detailed advice on managing engineering-oriented activities and conducting assessments. You also get idea-starters, teaching tips, and case studies to inform your own lessons. 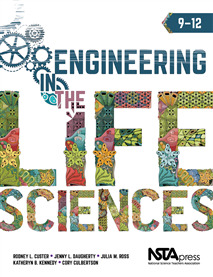 Full of both sound science and innovative approaches, Engineering in the Life Sciences, 9–12 brings fresh meaning to the terms “teacher-tested” and “classroom-ready.” It is specifically designed to address the curriculum and pedagogical needs of life science educators. The "Sample Chapter" is not helpful. While it may actually be a chapter in the book, it is just a meta-view of the approach taken in the book, there is no actual sample content.